Well, some interesting studies suggest that there are no sugar-alternatives that are as innocent as their manufacturers make them out to be. A September 2017 study 3 looked at blood sugar/insulin levels over a a 24-hour period in a group of healthy males. They compared sucrose with an artificial non-nutritive sweetener (aspartame), and two plant-based sweeteners (stevia and monk fruit sweetener). Subjects drank a sweetened drink and their blood sugar levels were measured over the next 24 hours. The aim was to monitor any spikes in blood glucose and to record the average levels of blood sugar. There was no surprise that the drink with 16 spoonfuls of sucrose caused a 40 point jump in blood sugar within the next hour, whereas the aspartame, stevia and monk fruit caused no reaction at all. This is why people advocate that it’s better for you to use the latter sugar alternatives. However, what was a surprise was when the average blood sugar levels were taken over the 24-hour period. 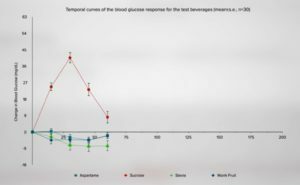 There was no significant difference at all between the overall effect of increasing blood sugar levels between all the sweeteners, as can be seen from the following results. 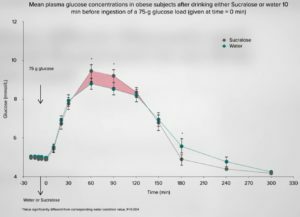 This is quite a surprise when you consider that the sucrose drinks had an equivalent of 16 teaspoon of sugar in them and it’s well known that when you consume a large quantity of table sugar (such as a large glass of Coke) it will cause a big sugar spike within an hour of consumption. To get a better idea of why this happens, we need to look at another study. This March 2017 study 4 used similar methods to the above study and, indeed, demonstrated that table sugar causes a significant sugar spike within 1 hour of consumption, whilst the non-nutritive alternatives (aspartame, stevia and monk fruit) had no effect. This can be seen in the following chart. 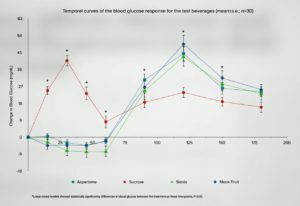 So, how could the average blood sugar levels be the same over a 24-hour period – irrespective of whether you used table sugar or one of the alternative sweeteners? One answer could be that taking non-nutritive sweeteners actually makes your blood sugar spikes worse later in the day. And, lo and behold, this was shown to be the case, as can be seen in the following chart. What you’re looking at is the artificial (aspartame) and natural (stevia and monk fruit) sweeteners causing an even higher blood sugar spike once the participants ate lunch an hour or so later. This is partly because they ate more at lunch when compared with the other participants who had already consumed 16 teaspoons of sugar – each teaspoon of sugar contains around 16 kcal, so that’s around 256 more calories already consumed by the sucrose group compared with the non-sugar groups. But is this the only reason? An earlier study reveals another rather confusing twist in this sugary tale. This earlier 2013 study 5 looked at the effect of non-nutritive sweeteners when added to a sugary drink. The subjects were a group of obese individuals. Splenda (a brand name of the an artificial sweetener and sugar substitute sucralose) mixed with sugar water was given to subjects and the sugar spikes were recorded. 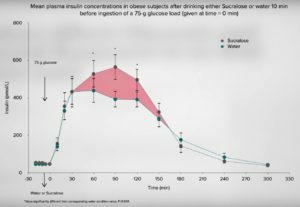 The results showed that there is a greater sugar and insulin spike within the first 60 minutes when this non-nutritive sweetener is added to the sugar drink than when the sugar drink is consumed on its own – as can be seen in the following charts. The above happens even though Splenda and presumably other artificial and natural non-nutritive sweeteners cause no initial spike when consumed on their own without being sugar. Interesting, eh? There’s scope for further research here, of course: for instance, into the effects of all the variations of non-nutritive sweeteners that are available in the shops, to see if they do indeed have the same affect as Splenda when they are consumed along with table sugar. But, whatever the mechanisms involved here (and I’m not convinced that they are fully understood yet), it reinforces the opinion that any added sweetener, whether sucrose, artificial or natural sweetener, is likely to cause both an insulin and a sugar spike. Of course, the occasional spike will not cause any major problems, but those people who have sweeteners in their beverages or who regularly consume foods that contain sweeteners clearly appear to be doing their bodies just as much harm as those who consume sugar – in fact, these alternative sweeteners may be having an even more damaging effect. A 2008 study 6 concluded that artificial sweeteners may fail to satisfy the brain’s desire for “natural caloric sweet ingestion” and thus cause a chain of biochemical responses that cause harm to the body. The brain is expecting calories from the sweet thing eaten, but they don’t come from the non-nutritive sweeteners. As with all things covered in these blogs, I suggest that sticking to a WFPB diet with no added sugar, oils or salt is the safest option if you want to consume the optimum diet for human health. Anything that has to be processed before consumption, such as all the above sweeteners (including table sugar) are ‘alien’ to the human body 20 and cannot be digested and absorbed in the same healthy way as the natural sugars contained within the natural whole plant. This also applies to the other forms of sweetener, such as honey (non-vegan), maple syrup, agave syrup etc – they are all separated food elements that the likes of Dr Joel Fuhrman has named Frankenfoods 21 for good reason. 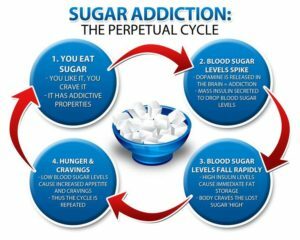 Sugar is addictive and it can be argued pretty convincingly that the only sugars we are wise to consume are those in whole foods, where they are bound to the natural fibres with which they grew. Environ Health Perspect. 2007 Sep; 115(9): A460.